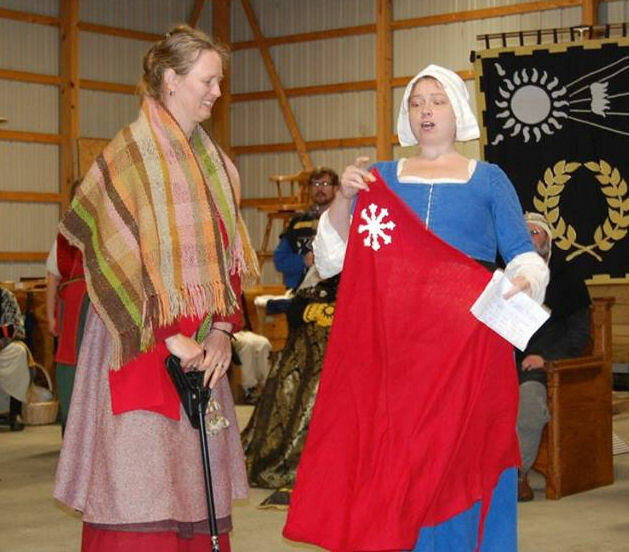 Lady Elska, winner of the first Scarlet Apron competition, with its organizer, Edelvrouw Lijsbet de Keukere. Photo by Lady Àine ny Allane. Good Gentles! War Practice is almost here! …… Okay, maybe not *almost,* but it is close enough to start thinking about the Scarlet Apron Cooking Competition! The challenge for 2018 will require a bit more time to prepare, so we wanted to make our announcement early. We hope you will join us! The next Scarlet Apron will be held on Saturday, May 19, 2018, at Æthelmearc War Practice. Contestants should plan to have a portion of their medieval preserves available to be sampled by the judges and populace, as well as some to remain untouched to be left on display for presentation purposes. More information will be provided as arrangements are made. In the meantime, please send any questions to Edelvrouw Lijsbet de Keukere (Facebook Messenger is preferred – Keirin Lazauskas-Ralff). Is there any news about the scarlet apron contest at war practice 2019?